Increased global exposure and thereon demand has been occurring at a time when Burgundy production levels have been falling, 2012 marked a drop of 40% since 2009, low production once again in 2013 has only compounded the problem. In short, collectors the world over want access to Burgundy’s leading plots and producers. The fall in production and rapid increase in demand has resulted in healthy price rises on release, with each vintage releasing higher than the last, the market has been only too happy to pay these prices. 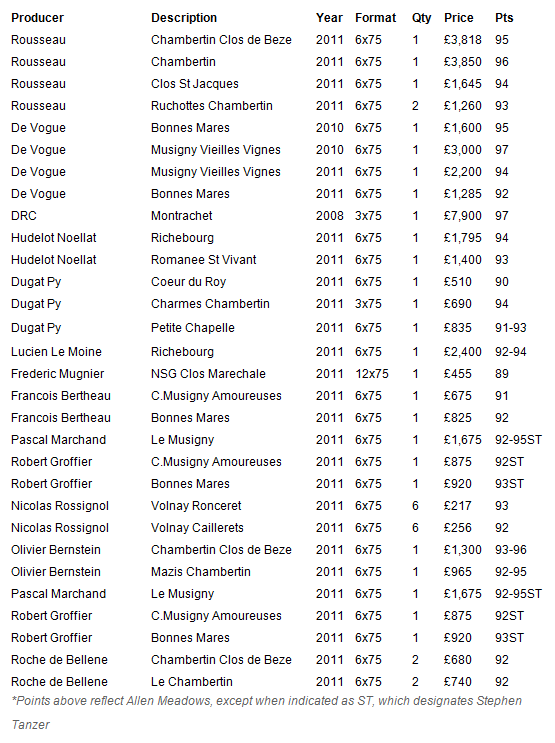 We have observed that leading Burgundy plots require a year in bottle before the price stabilises, as such the 2011s curated below offer a very attractive entry point, all priced as lowest in the UK market. All stock was purchased en primeur from the UK agents, has been stored in Octavian since becoming physical and is immediately available. The selection offers great value drinking wines up to the most prestigious Grand Cru vineyards and producers, including Rousseau, de Vogue, Dugat Py and Hudelot Noellat. We have also included two stunning 2010s from Armand Rousseau and a 3x75cl case of DRC Montrachet 2008. As any lover of red and white Burgundy knows, prices have continued to climb steadily vintage after vintage, although not from speculation. Instead, Burgundy values have risen based on increased global demand and an eye-wateringly small supply, made even smaller when factoring in challenging weather. The 2011 red Burgundies are elegant and pure, and, best of all, accessible at a young age as opposed to longer-term vintages such as 2008 and 2010. Both long-standing fans of Burgundy and those just looking to dip their toe in for the first time would do well to purchase this charming vintage while waiting for their 2010s to mature.